The penultimate day here at the Zeil- and Surfcentrum Brouwersdam saw great comebacks, high performances in difficult conditions and two local riders on top of the podiums. In the double elimination of the junior girls, 14 years old French gir Salomé Fournier had a great comeback, winning three heats in a row. 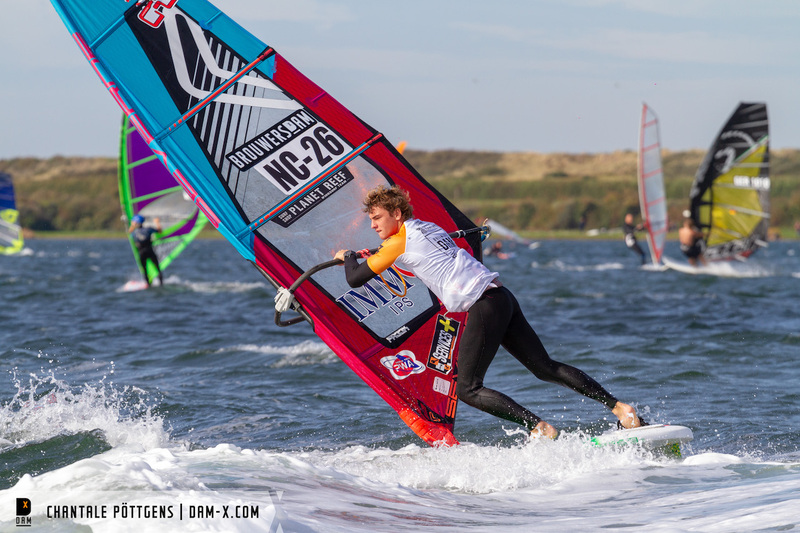 Since she managed to take out leader of the single elimination Lina Erzen, race director Thijs Van der Meer called for a super final. Erzen once again showed her potential and managed to win the double elimination in the end. Sterre Meijer (Severne) came in third and Margo Kurvink fourth. In the boys fleet, there is particularly one rider, who deserves a mention here apart from the top four. 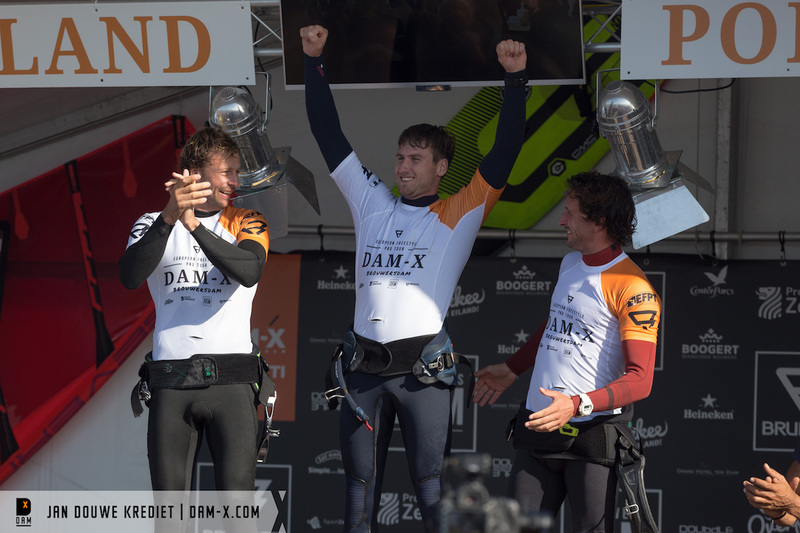 Local sailor Tigo Kort (Severne/JP), was sailing his way up in the double elimination, winning three times by taking out Bodhi Kempen (Severne), Tim Gerdens and Tijmen Meijer (Severne) to then get stopped by Nil Bacon (Severne/Fanatic) from France. Tigo landed Grubbies, Esliders, Spocks and Flakas in all of his heats. Lennart Neubauer (Severne) from Greece impressed the judges with one handed flakas, shakas, konos and even a regular chachoo in the final against New Caledonian Corto Dumond (Severne). Just like in the girls fleet, a superfinal was sailed to determine the winner of the double elimination. Corto stepped up his competition game in the following heat, landing super nice culos and konos, as well as a shaka and a bob to win over Lennart in the end. Nil Bacon could take out Stefan de Bell and therfor secured his podium position. Due to the tricky conditions, race director Tom Hartmann decided to extend the heat time to nine minutes and only count the two best moves each tack. The wind seemed rather patchy and this decision would guarantee to get a representative result. 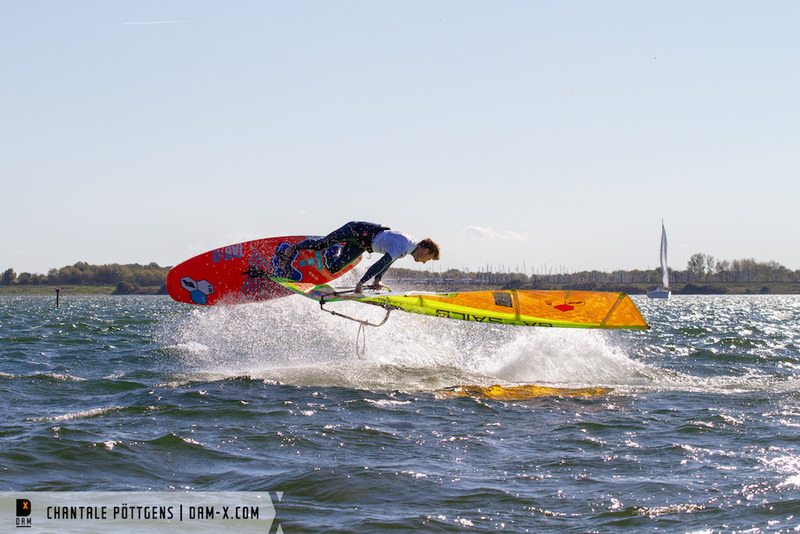 Sailing his way up in the single elimination has been Julian Wiemar (Severne) from Germany. He took down Felix Volkhardt (Severne/Severne) and Antoine Albert (Goya/Goya), landing power and sliding moves each tack, to then get stopped by tour-leader Tonky Frans (RRD/RRD) in the quarter final. Making their to the quarter final have also been Mattia Fabrizi (Patrik), Giovanni Passani and Riccardo Marca (Duotone/Fanatic) from Italy, yet they couldn’t get past their opponents Adrien Bosson (Duotone/Fanatic), Steven Van Broeckhoven (Gunsails/JP) and Davy Scheffers respectively. From the semi-final onward three moves per tack would count and we have seen one of the closest battles of the day, when Bosson sailed against Scheffers for the place in the winners final. With a difference of 0,27 points only the French sailor had to let the local rider pass. The two riders showed an exceptional performance with culos, burners, shaka, shove-it spock (Bosson) and air funnel-funnel, burner 360, grubby into grubby, chachoo and spock culo to count (Scheffers). Steven Van Broeckhoven, who went into that season with no expectations to win the title, took out tourleader Tonky Frans to advance into the winners final, where he had to face Scheffers. Both riders put on a great show and were both technical and stylish in their maneuvres. In the end, it was Scheffers who could decide the heat in his favor. Adrien Bosson, who was placed second in the EFPT Lanzarote earlier this year and who just became Vice Worldchampion in freestyle, managed to put together a great heat against Frans in the losers final and secured the third podium position. Since three years now, Brouwersdam is THE spot where the freestyle womens title is being awarded. Nine freestyle ladies signed up to fight for the top positions in the overall ranking. Lina Erzen from Slovenia, one of the youngest competitors, impressed today with super solid flakas and spocks in her heats and ended up in fourth place. 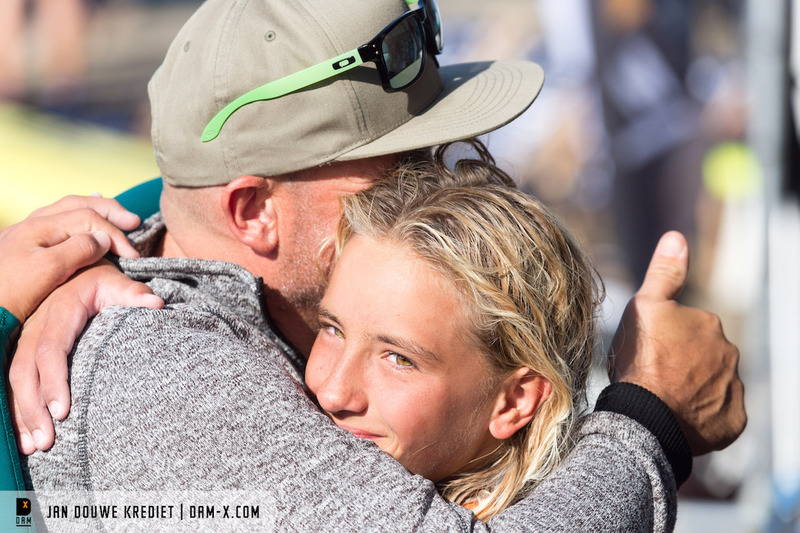 Arrianne Aukes (Duotone/Fanatic), who is a regular on both the EFPT and the PWA, wasn’t 100% on form due to an injury that occured at the Worldtour event in Sylt last week, but managed to pull the third position afterall. The battle for first place has once again been between local girl Maaike Huvermann (Severne) and Sara-Quita Offringa (Neilpryde), who hasn’t been losing a freestyle heat in many years. Offringa has been performing on an incredibly high level over the past decade and seemed to be unreachable – especially in competition. Since about two years now, Huvermann is at her heels though, giving the multiple World and European Champion a hard time. Today was her time to shine. Maaike performed in a solid way, landing regular konos, funnels, clean flakas and esliders and even a shove-it spock in her heats. The Dutch girl displayed some great competition sailing, using the tricky conditions in her favor and could over her friend and opponent from Aruba. The atmosphere at the stage, when the winner got announced, was something else. 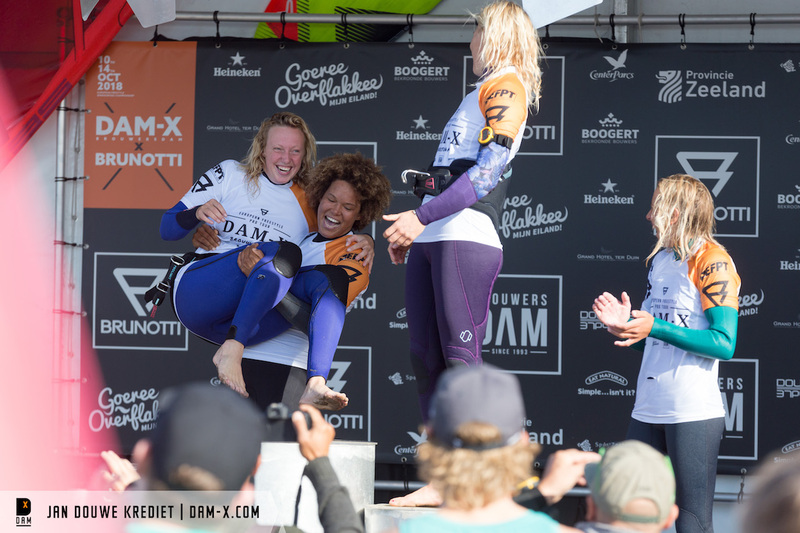 Sarah-Quita showed some great sportsmanship, by lifting Maaike onto the podium for first place, clearly acknowledging her performance and cheering for her friend. The double elimination has been started straight after the finish of the single elimination, however the conditions were so up and down that heats had to get cancelled and re-sailed several times. At 06.00 pm race director Tom Hartmann called it a day. Tomorrow is the last day of competition and this is what we can say already: in case results remains the same, we have got two new European Champions in 2018 in the pro fleets and two new champions in the junior divisions.